The Bodum brand has long been trusted with the plunging of coffee and tea…one of the most critical responsibilities any company could possibly take on. Far more important than stocks and shares and investment banking. But now the brand we all know and love have decided to spread their wings in to the skies of kitchen appliances, with the new Bistro Programmable Coffee Maker. This beautiful appliance creates twelve cups of coffee that even the biggest coffee snub will love. It’s equipped with a rain shower head that evenly distributes the water over your ground coffee for consistent extraction with a balanced full flavour. The clear lid allows you to view the brewing process from above, while the glass carafe is built with a non-slip and easy to grab handle. 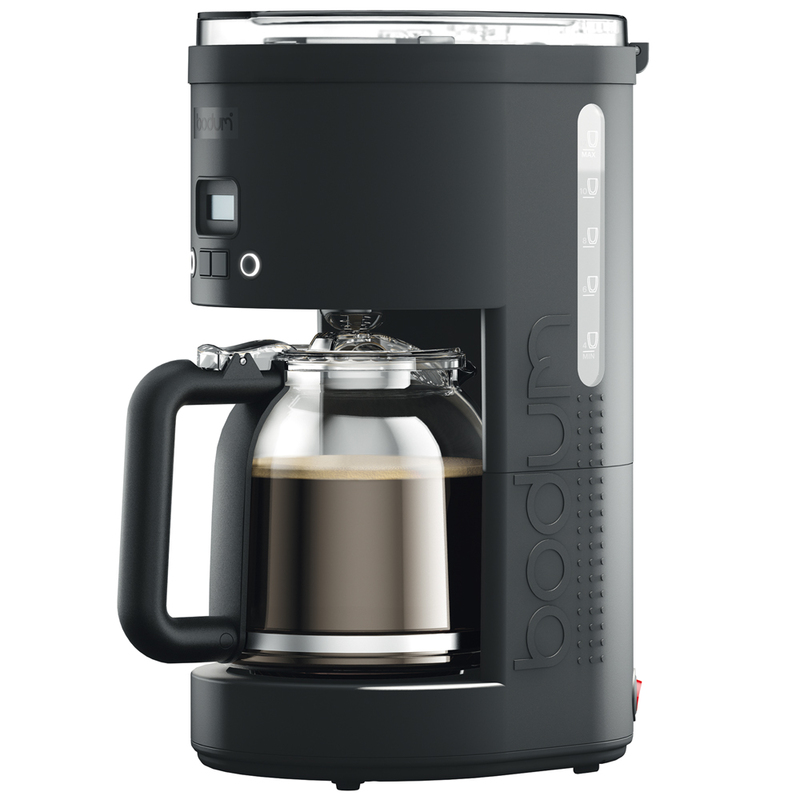 The heating element in the base keeps the carafe and coffee warm, while the programmable clock can be set up to 24 hours in advance for extra convenience. Crafted from durable plastic, glass, metal and stainless steel. Rain shower head evenly distributes water over ground coffee for consistent extraction every time. Permanent stainless steel coffee filter – no paper, no waste!. Clear lid allows you to view the brewing process. Clear window on the side allows you to view the water level. Glass carafe is equipped with a soft grip handle. Stain-resistant heating plate keeps coffee warm for up to 25 minutes. Easy to read, backlit LED display. Programmable up to 24 hours in advance for convenience.